Following a sixth-place finish at the NEWA Dual Championships last week, the wrestling team continued to struggle during their quad-meet at sixth-ranked Ithaca College on Sunday, Feb. 3. The Cardinals went on to finish 0-3, picking up losses against Little Three rival Williams (18-16), Ithaca (30-12), and SUNY Oneonta (24-15). Wesleyan wrestling now stands at 4-8 in dual meets this season. The first dual of the day was against Williams. Zack Murillo ’19 started the day strong for the Cardinals at the 125lb stage. Murillo defeated the Ephs’ David Yeh in a suspenseful sudden death victory, resulting in a 5-3 decision. Amir Daouk ’20 then continued the hot start by defeating Ben Morton in a 12-6 decision at the 133lb stage. Roy Forys ’20 (10-2) and Simon Chee ’21 (14-3) would later dominate both of their opponents in major decision victories at the 165 and 197lb stages, respectively. After several action-packed fights, the score remained tight. The dual eventually culminated at a decisive heavyweight matchup, where Williams’ Sebastian Dziadkiewicz took the win over Harrison Karp ’21, giving the Ephs a marginal victory of 18-16. On the second dual of the day against Ithaca, the Cardinals picked up 12 points but lost by a significant margin as the Bombers finished with 30. There were, however, some notable moments during this matchup. Shane Ross ’19, Forys, and Chee continued their winning streak by picking up their second wins of the day with decisive victories over their opponents. Furthermore, first-year rookie Marco Gaita picked up his first win of the day in a close matchup against Eze Chuekwezi, resulting in a 6-5 decision. These performances, however, were overshadowed by three pins that the Cardinals sustained during the duals at the 157, 184, and 285 stages. On the final dual of the day, the Red and Black were pitted against SUNY Oneonta. Forys remained undefeated, finishing the day 3-0 after defeating his opponent in a 6-2 decision victory. Murillo and Gaita also picked up decision wins at this dual, both finishing with 2-1 records. One of the more memorable moments of the dual was the Cardinals’ only victory by fall of the day, when Daouk pinned Andrew Desousa in five minutes and 50 seconds. Despite some strong efforts, however, the Cardinals still fell short against the Red Dragons, losing in a final score of 24-15. Despite having a winning record for the past three consecutive seasons and advancing to the NCAA Quarterfinals last season, the team has faced numerous challenges this season. Chief among the team’s issues this season was the departure of two of its strongest wrestlers from last fall–All-Americans Isaiah Bellamy ’18 and Devon Carillo ’18. 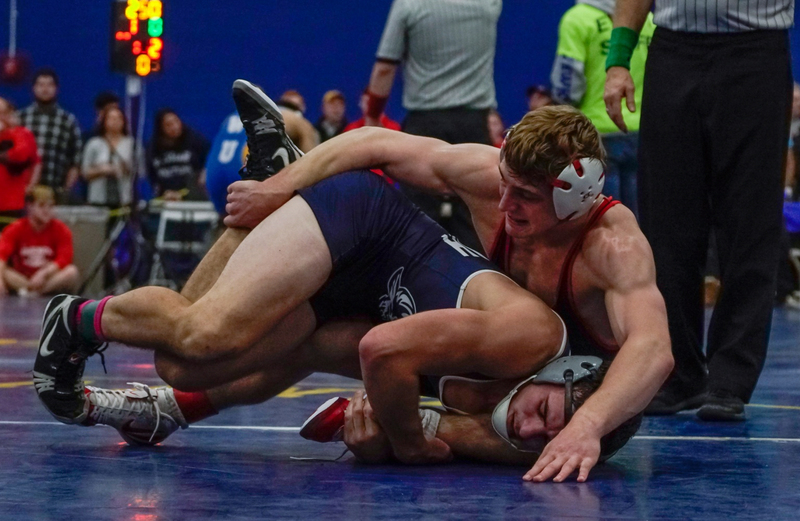 Furthermore, the team has been plagued with several injuries, forcing wrestlers such as Daouk and Tristan Stetson ’20 to match up against opponents with significant size advantages–in higher weight classes than normal. On the bright side, the team has seen breakout seasons for some of its young players. Perhaps the most notable example would be Forys, who earlier this season was named Most Outstanding Wrestler at the Doug Parker Invite, as well as New England Wrestling Association (NEWA) Co-Wrestler of the Week. Forys now stands with an individual record of 28-3, which includes nine pins. Other wrestlers who have displayed strong performances this season include Murillo and Chee, currently with individual records of 22-6 and 19-6, respectively. “As the post-season edges closer and closer, the team is starting to focus on performing well at the Northeast Regional Tournament, qualifying for the NCAAs, and/or earning All-American Honors by placing top eight at the Nationals,” Chee said. With just one event left in the calendar before the NCAA tournament starts, the Cardinals will host Southern Maine, New England College, and Scranton for Senior Sunday, Feb. 10, at Silloway Gymnasium. The team will look to bounce back for the National Championships, which will take place early next month in Roanoke, Va.
Franklin Ribli can be reached at fribli@wesleyan.edu.